You have the tasks, we have the solutions. 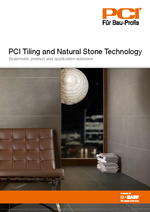 This brochure will give you an overview of the various product and system solutions for the tiling and natural stone trade. You also find practial tipps very helpful for the daily work on site. 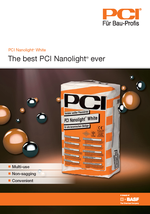 The multi-use flexible joint grout PCI Nanofug Premium is part of a new generation of intelligent products from PCI. What's so special about it: it combines convenient application with many positive product properties for applicators and building owners. Five new colours have now been added to the colour range: ochre, beige brown, light brown, intensive brown, red brown. 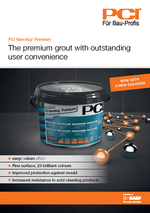 PCI Nanofug Premium offers the maximum design leeway with 23 colours in four warm colour groups: neutral, cool, warm and earth tones give the tiler the possibility to even play better with harmonic colours and colour contrasts. The white colour means that this tile adhesive is predestined for the laying of glass tiles and mosaics. It is suitable for a wide range of applications, indoors and outdoors, on walls and floors, for all types of tiles and for all substrates. PCI Nanolight White gives tilers the pleasant Nanolight® feeling, with easy handling, convenient processing and effortless application.